Texas is a warm state as shown by its USDA Hardiness range of Zone 6 to Zone 9. Flowers in Texas should be hardy to those zones depending on the area in which you live. Always check to see what zone you garden in prior to planting to save yourself some headaches.The best flowers to plant in Texas should be hardy to Zone 6. The purpletop verbena (Verbena bonariensis) belongs to the verbena family of plants. Other common names include purpletop vervain, tall verbena and South American verbena. It is an easy to grow and fast growing perennial that attracts butterflies. It reaches 3 to 6 feet high and 1 to 3 feet wide. Its leaves are 3 to 5 inches long with purple flowers in 2- to 3-inch wide clusters. Plant a purpletop verbena in full sun or partial shade in any soil. 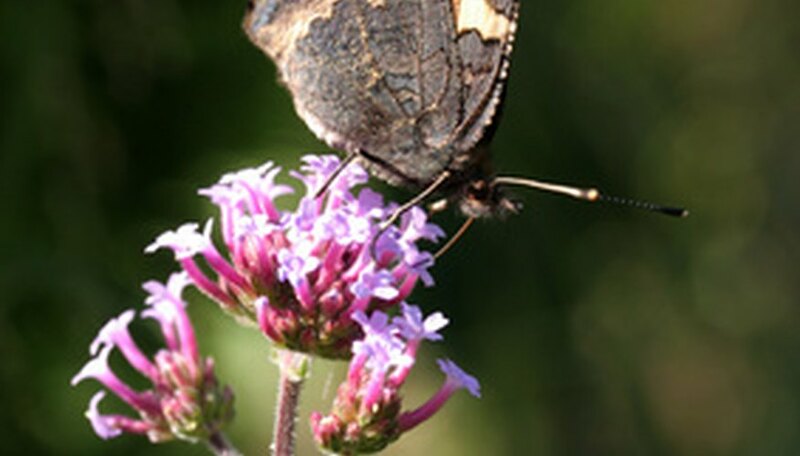 Propagate via seed, cuttings, or division in USDA Hardiness Zones 7 through 11 (Gardeners in North Texas may have problems growing purpletop verbena). The small globe thistle (Echinops ritro) belongs to the aster/daisy family of plants, and is a perennial that attracts butterflies to the garden. Small globe thistle grows 2 to 3 feet tall with 8-inch prickly leaves, and 1- to 2-inch wide flower heads. Blooms appear silver-blue when they first open, and age to bright blue. Plant a small globe thistle in poor soil with full sun and regular watering. Propagate via seed or division in USDA Hardiness Zones 3 through 10. The Mexican sunflower (Tithonia rotundiflora) belongs to the aster/daisy family of plants. It is a fast growing annual that attracts butterflies. The Mexican sunflower gets 5 to 6 feet high and 3 to 4 feet wide. Its leaves are 4 to 10 inches long and coarse while flowers are red-orange and 3 inches wide. Plant a Mexican sunflower in full sun or partial shade in well drained soil. Propagate via seed in USDA Zones 5 through 10 (North Texas may have issues with hardiness). The wishbone flower (Torenia fournieri) is from the figwort family of plants. It is also known as bluewings or torenia. This is an annual that is attractive to hummingbirds and gets 1 foot tall. The leaves are hairless and 2 inches, while flowers are 1.5 inches long and velvety. The color of the wishbone flower depends on which cultivar you are growing. Plant a wishbone flower in moist soil in partial to full shade in warm climates and full sun in cold climates. Propagate via seed or cuttings in USDA Hardiness Zones 6 through 9. The ageratum (Ageratum houstonianum) is part of the aster/daisy family of plants. It is an annual that grows 2 feet tall with 4-inch leaves and flowers in a wide variety of colors. Plant an ageratum in bright sun or in partial shade for hot climates. Propagate via seed in USDA Hardiness Zones 5 through 10.